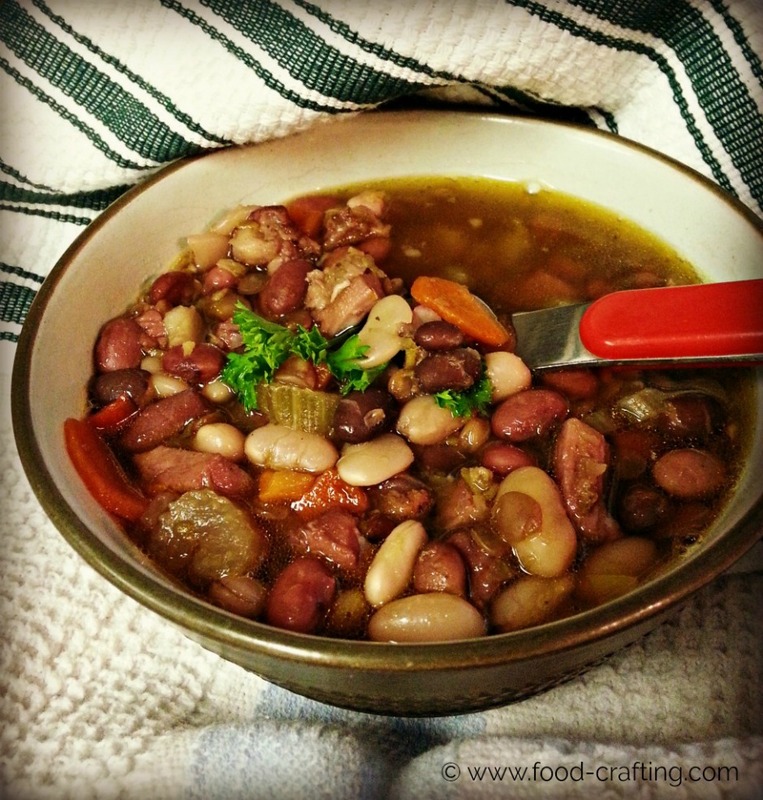 Mixed Bean Ham Soup – It’s on the menu for dinner tonight. Soup in April? Yes indeed. 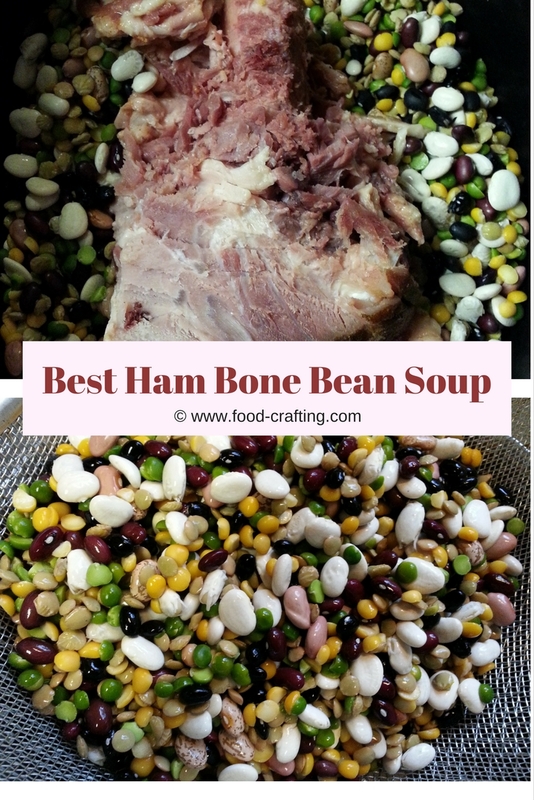 Although today is April 9th, the weather is perfectly suited for a comforting mixed bean ham soup using the meaty bone from the Easter meal centerpiece. You know it’s right up my kitchen “alley” when the package itself calls it home-style soup! Looking for baby vegetables? So much tastier than wavy cut frozen veggies! From baby carrots to turnips and radishes – you’ll find them HERE! Funny thing is that I picked up the soup package before I even selected the ham. For Easter this year we turned to one of our favorites – Honey Baked® ham – to make things quick and easy. The ham was the perfect size for the family gathering. We’re down to a “quarter” ham because the price (far from frugal) has gone up steadily since the first ham we purchased years ago. It still gives me plenty of meat off the bone for a heartwarming soup. Dutch Oven or Slow Cooker For This Honey Baked Ham® Bean Soup Mix? The package calls for the soup to be prepared in a Dutch oven pot but this mixed bean ham soup can easily be adapted and prepared in a crock pot with a minimum of supervision. The soup is prepared using my trusty oval-shaped, Rival® Crock Pot on HIGH for 4 hours. No touchscreen control panel or programmable cooking time as in this new model. I must admit I have a growing collection of slow cookers. As the chef in this household, I have a purpose for each size of slow cooker. There’s the 18 oz. 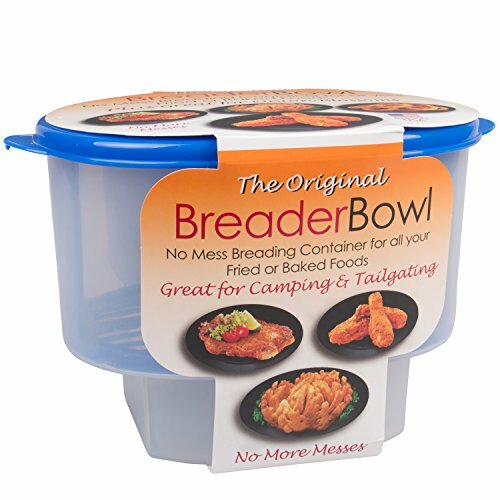 gravy warmer for those who insist on the gravy being hot at all times to large soup tureen for game day to the 7-quart wonder for those large roasts and mega meals. Perfect Meat Lifter For Slow Cookers! I’ve had so many bad experiences trying to delicately remove a large piece of meat like a turkey or a large roast of beef from the oven – even from the slow cooker. It’s not as easy as it looks to remove a full-size picnic shoulder from the slow cooker in one piece to transfer it to the grill or the oven. Our favorite barbecue recipe is for a large picnic shoulder, slow cooked to fall off the bone tender and then placed on the grill for a layer of smoky, barbecued flavor. If you don’t want to fire up the grill, you can transfer the ham to the oven roasting pan. The easiest way to do transfer any large piece of meat from the slow cooker is with the silicone mat seen below! When it comes to slow cookers in different sizes, I can hear the DH muttering about the “multiple purposes” but you know I’m right. The vintage 6 quarts, oval-shaped, slow cooker is perfect when making meals with large cuts of bone-in meats. My goodness, this particular slow cooker has even handled a whole leg of lamb. Since my crock pot meal will be supervised, I can regularly check on the cooking process to make sure the beans do not turn to mush – especially the lentils. How much easier can it be than opening a bag full of beans? The instructions call for rinsing the beans. Notice – I can hardly resist taking a photo of the colorful wet beans. Technically, you don’t need anything other than the Mixed Bean Ham Soup mix to prepare this soup. Add layers of flavor with the use of fresh vegetables. One pack of HoneyBaked® Mixed Bean Soup mix. Other soup mixes are available. 1 ham bone with a good amount of meat left on the bone. If the bone is bare, buy a small ham slice to the soup. It will break down into small bits of meat by the time the soup is cooked. You can also purchase prepared packs of fresh chopped soup vegetables at Wegman’s® or in the produce section of nearly all supermarkets. After all, if your plan is to make this the main meal, might as well make it a hearty soup. If it were not for the orange specks in the spice pack, the carrots are not recognizable as such so a handful of fresh vegetables will not ruin the recipe. These dried vegetables are popular but they are the veggies of last resort! Place the beans in the slow cooker, add the ham bone and pour 10 cups of water over the main ingredients. Sprinkle half of the seasoning packet which is included in the mix. OR the entire packet of seasonings. Up to personal tastes. According to the package, the spices include garlic, onions, celery, parsley, carrots, and bell peppers. But, you really have to get a magnifying glass out to find them. Mere specks of freeze-dried veggies are not going to make a rich stock. It just so happens that I have some celery and carrots in the fridge, as well as fresh parsley so I added some of each, finely chopped, to the pot. Add fresh vegetables because the dried bits in the mix will vanish during the cooking process. 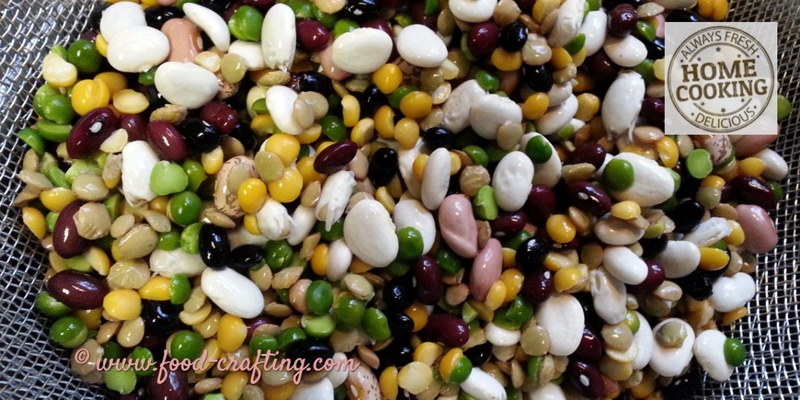 If you are on a sodium restricted diet, this mixed bean ham soup mix is not for you. Actually, I’m not sure how they manage to raise the sodium content of canned soups and dried soup mixes to such a level. The soup is ready now but I am rather disappointed with the flavor. You can kick up the flavor level another notch by adding some garlic paste to the broth. Time to set the table. Dinner is ready. Check out this Ham Soup for a variation on a theme. Click HERE for additional information about Honey Baked Ham® soup mixes. Ever considered making this soup from scratch? Without a soup mix? It’s just as easy . Smoked ham bones and meat are readily available at the supermarket and it does not take huge quantities to add intense flavor to a simple vegetable soup. You can also add flavor to a simple soup with the addition of rich soup bases such as Better Than Bouillon®. Stored in an kitchen organizer bins like these, I keep an entire collection of the small jars in the fridge to flavor everything from soups to gravies. Ever tried the Roasted Garlic base? Oh my! This cookbook for DIY Gift Jar recipes includes a mixed bean soup which can easily be flavored with smoked ham hocks. Add a couple recipe card gift tags giving ideas for variations of the original recipe. As a rule, I always make 6 to 8 servings of soup. Soup is Mom’s favorite go-to meal. All she has to do is reheat it for a quick an easy dinner. It is also the DH side dish with any meal, spring, summer, fall & winter! He can easily eat a full 5 course meal – soup, salad, main dish, vegetables and dessert. Any day of the week. In my freezer, you will find several of these convenient portion-sized “soup cubes”. Each section is equal to an 8 oz. serving of soup! 1.1 Dutch Oven or Slow Cooker For This Honey Baked Ham® Bean Soup Mix? 2 Perfect Meat Lifter For Slow Cookers!